Idle rollers for medium unit handling conveyors in internal, external, normal, dusty, humid and corrosive environments. 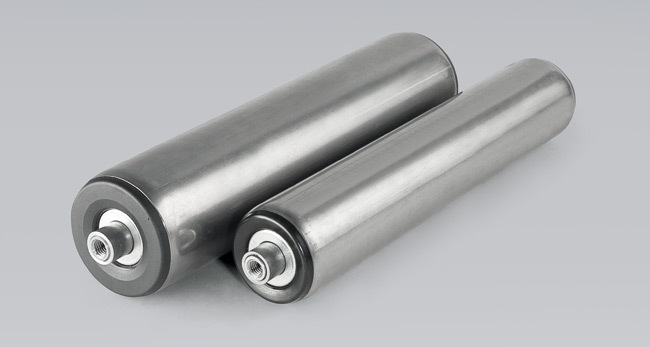 The rollers consist of a special steel tube swaged over the bearing housings which are made from technopolymers having high elastic properties, sealing and resistance to mechanical forces and to corrosion. The standard design utilises radial precision ball bearings 6202, lubricated for life, protected by the MECA sealing, a double radial labyrinth with zinc-plated cover cap to allow use in medium severe environmental conditions. The drawn steel standard shaft has standard drilled and threaded execution for screws M10 or alternatively can have bushes ch17. Application temperatures range from –5° C to +80° C.
The construction features of the materials employed allow an excellent balancing and a low start resistance. Under request they can be supplied with AISI 304 tube and shaft.